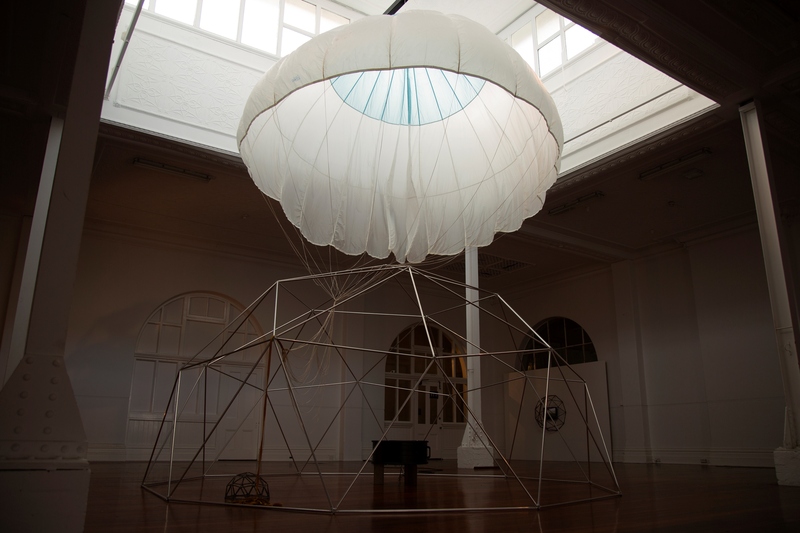 Every Step Is Moving Me Up, 2018 (installation view) Aluminium, parachute, papier-mâché, industrial fan. Inspired by the early unsuccessful attempts to reach the North Pole from Svalbard by sled pulled by a parachute over the sea ice. Amy Perejuan-Capone. Fenians, Fremantle and Freedom Inc.
A three day Festival in February 2019, honouring the life and works of John Boyle O'Reilly. This community event promotes the message that support for others and connection to culture, builds resilience. A new piece of theatre set on Australia Day. Three young couples with diverse views on topic issues share dinner together. The play explores some of the challenging aspects of the changing face of Australian society. A series of installations, site-specific typographic paintings placed throughout Fremantle, mapping a virtual path connecting the Fremantle’s cultural institutions. A series of activities designed to kick start the creative spaces in the new Sustainable Housing for Artists Cooperative, White Gum Valley. The programme includes an inaugural exhibition of resident artists plus workshops and masterclasses.